The question is, should you bother? Discounting the unintentionally hilarious The Da Vinci Code, Ron Howard hasn’t made a comedy since 1999’s EDtv. He’s back on the laughter trail with this tale of marriage, infidelity and friendship - but after a decade of dramas, it seems he’s lost his sense of humour. Despite the presence of Vince Vaughn and Kevin James, two titans of mainstream US comedy, The Dilemma is a giggle-parched mish-mash that lacks the bite of such classic marital movies as The War Of The Roses. Written by Allan Loeb (who co-wrote last year’s Wall Street 2), The Dilemma revolves around the idea that however well you know your partner, you can’t know everything. Vaughn and James play Ronny and Nick, old friends and partners in an auto design firm. 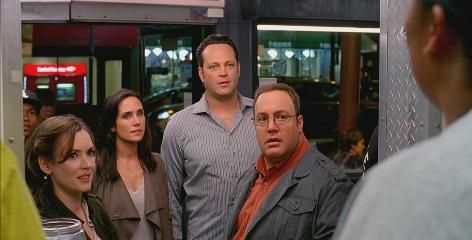 While the nervy Nick is married to Geneva (Winona Ryder), cocksure former gambler Vaughn has yet to pop the question to his girlfriend, restaurateur Beth (Jennifer Connelly). The dilemma comes after Ronny spies Geneva with another man and agonises over whether he should tell Nick. It’s a decent enough premise, but what follows is a chaotic series of events as he attempts to get Geneva to confess the affair. Shorn of decent one-liners, Vaughn spends most of the film speaking in speeches and pep talks (even stealing from Kurt Russell in Miracle), which become almost as tiresome as the toe-curling bromance between him and James. While Connelly is left with a thankless role present only to drive the plot, at least Ryder has some fun with a part almost as schizophrenic as her turn in Black Swan. Sadly, the film’s funnier characters – Channing Tatum as Ryder’s tattooed, drugged-up lover Zip, and Queen Latifah as a flirty GM executive who keeps talking about getting “lady-wood” – are really too peripheral to make a difference. What results is a film with an identity crisis: an awkward hybrid of comedy and drama that’s never sure of which avenue to pursue.